June Dudley is a native Texan who grew up on a ranch, and she loves to paint the Western way of life. In many of her images, she features the wonderful children she also loves to paint. Spring in Texas is an endless blanket of fields of color along the rural roads with the many varieties of wild flowers. 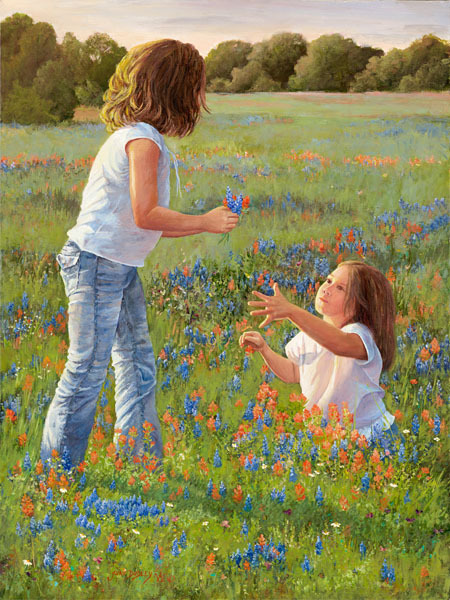 These two little girls are enthralled with the blooms that surround them as they select a beautiful bouquet.from the "Wild Pickin's". "Wild Pickin's" will be shown at the Western Artists of America exhibit and sale, March 30-31, 2012.